Ever the awkward, British Sea Power have picked the twelfth anniversary of the release of their debut The Decline Of British Sea Power as the time to reissue it in a range of deluxe packages and to undertake a short tour to play the album in full. We caught their Manchester show and were given a stunning reminder of how inspiring and unique they are. They run through the album from start to finish first, with the exception of A Wooden Horse which they save for the encore, teasing us that they'd forgotten a song, and then play a selection of songs from across the twelve years since the album came out. 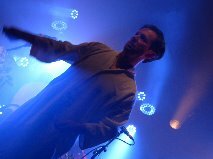 When Decline came out, people were often unsure what to make of them and the album only stumbled to number 54 in the charts, although it's undergone a steady gradual reappraisal since as the band have grown their fan base to the point that they can even contemplate this tour yet alone fill halls like The Ritz. The first time we saw them was utter chaos, so much going on up on stage that everything seemed in conflict. When it came together, it was astonishing, but often it left us scratching our heads. We persevered with them and the chaos subsided to the point where it retained an originality and a genuine outsider identity, but with a power that only they created. Tonight's show reflected that too - the first two songs from Decline - Apologies To Insect Life and Favours In The Beetroot Fields - are a melting point of sounds thrown together that take time to assimilate and whilst they're far from having all the edges knocked off them, there's a strident purposefulness to them even with seven of them on stage throwing ideas into the mix so that the album is reinvented, reinvigorated rather than simply replayed. It's good to see Eamon back from Brakes to tour this album he played a pivotal role in - and within the first song he's crowd-surfing with a drum in his arms. Five of the tracks off the album were released as singles over a period of two years and, like all shows of this nature, it's these that get the best response. Carrion, Remember Me and Fear Of Drowning are the songs that got this loyal partisan crowd into the band all those years ago and still show that despite their propensity to do the unusual, and their live shows at the time were as much theatre as they were music such was the intensity of what was going on up on stage with strange costumes and audience participation, that they have always been able to cross the line between mercurial eccentricity and writing great radio-friendly singles. The end of the first part of the show before they depart for a short break is a case in point for the former. Lately weighs in around fourteen minutes, the second half of it a chaotic tsunami of instruments crashing together, but tonight they weave Julian Cope's Out Of My Mind On Dope And Speed Into It as their famous twelve foot dancing costume bear joins them on stage. 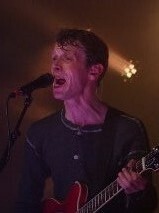 The second half of the set spans the rest of their career, from post-Decline single The Spirit Of St Louis through to the title track of their last non-soundtrack album Machineries Of Joy from 2013. The nature of the evening's events means that there's a focus on the earlier years though - Scottish Wildlife Experience and A Lovely Day Tomorrow both feature on the second disc of the deluxe album and fit perfectly with what's gone before it. There's also three songs from the follow-up album Do You Like Rock Music which built on the foundations of Decline and won them a bigger audience - including their most commercial moments in No Lucifer and the national anthem for the generation in this room that is Waving Flags that makes the declaration "we are astronomical fans of alcohol" that mirrors Yan's outstretched arms welcome at the start of the evening with a beer in each hand. There's plenty of tone-deaf singing around me as the more familiar moments of the evening's events proceed and that's what makes British Sea Power shows, whether they be in bigger halls like this or the intimate shows they put on themselves as part of their Krankenhaus club nights, such a communal celebration - the band reach out to their fans and wrap around so that we can all experience it together. They finish off the evening with A White Horse, the "forgotten" closing track off Decline and it's a fitting way to bring the evening to a close as tonight is about celebrating an album that means the world to those that are in the room and proof that the current trend of revisiting albums shouldn't just be a band rehashing their most popular / successful record to make a quick buck and can be about so much more. Various deluxe CD / DVD and vinyl editions of The Decline Of British Sea Power are out now. Their website can be found here and they are also on Twitter and Facebook.